A few weeks ago a sweet neighbor of mine sent me this picture of Charlie. The picture was taken by her husband on our first Christmas in the our neighborhood. I don’t even remember the picture being taken, but I do remember the context. We had been invited to dinner at our neighbors’ house for the first time, finally settling into our new community. Charlie, not quite 2 years old, was enamored by their son’s train set. He was moving the trains along the track, making all the sounds, engaging Hudson to play alongside him. I remember watching him, already trying to connect and make friends with anyone he came in contact with. When I received this picture, clearly the memories of this day rushed in, but as I looked closely, what I noticed was how the darkness in the picture complimented the light. Charlie’s darkened image is highlighted by the glowing of the lights behind him. It makes the picture so much more complex, dynamic, and beautiful. 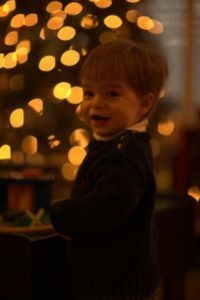 This image of Charlie truly illustrates how the darkness and light of the last year have impacted our lives. In context, Dumbledore is warning the students that hard times are coming. He is preparing them for it with his speech. But he is also reminding them that they must look for the good, even when darkness falls upon them. There have been and will continue to be many dark times is our life. The darkness will never fade when it comes to losing Charlie. But there is still so much light surrounding Charlie’s life. I am reminded that most of our friendships have developed and prospered because of Charlie. He made us parents, the most priceless adventure of our lives. In the last year and a half, because of Charlie we have grown a foundation, began construction on a well, and helped start a Family Empowerment Program to combat the orphan crisis in Ethiopia. In moments of deep darkness, I have to remind myself of the light, the light that Charlie continues to bring to us. So this Christmas Eve, as you settle in with family and friends, look around you. Look at the Christmas lights on your tree or outside as you are riding in your car. Think about how different they are when they are surrounded by the darkness of night. Even though the dark can be scary and unsettling, notice how it accentuates the lights. Christmas lights are not as pretty, warm, or meaningful in the brightness of day. But in the dark, their glow is beautiful. Life will bring us darkness, it’s inevitable. But find the light, the flickers of wonderful, joyous moments that God has given you to guide you through the darkest of night.